Spaces Between The Gaps: Having Trouble Getting Things Done? I found this manifesto over on the blog of Bre Pettis quite some time ago. It appealed to me then and it still appeals to me now. I don't know about you, but getting stuck instead of getting done is a recurring issue that I am working on playing with like a kaleidoscope. This collection of ideas on done makes me laugh and lightens the load of the ever-present get-done list. Whenever I restumble across this, it helps. 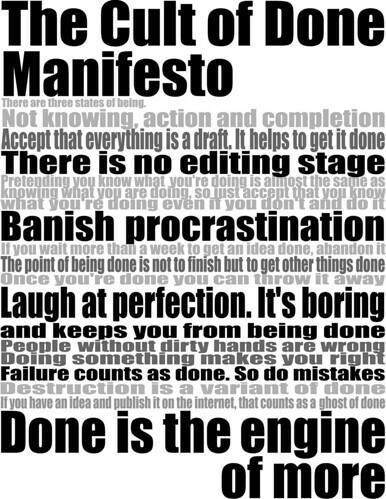 Love the manifesto! Didn't I write it? Don't recall. Done.